Choice Schools Associates is proud to announce that Ali DuBois has been named a finalist for the 2019 Michigan’s Charter School Administrator of the Year Award! From nearly 600 total nominations and 200 submitted applications, DuBois was honored as a finalists. She was selected as part of the top 5 administrators due to her incredible dedication and talent. She embodies what makes charters unique – the innovation, professionalism and passion that drives success in her school. Ali DuBois is completing her fifth year as the Head of School at Muskegon Montessori Academy of Environmental Change. Before taking on the Head of School role at MMAEC, DuBois was a teacher at West Michigan Academy of Environmental Science for five years. Her commitment to excellence has also granted her the 2018 School Leader award through Choice Schools Associates. We are so proud of Dubois. DuBois will find out in early May if she has been selected as the 2019 Michigan Charter School Administrator of the Year. Muskegon, MI, April 15, 2019: Back by popular demand, Pioneer Resources presents the 2nd annual “Hats and Horses” fundraiser on Saturday, May 4, 2019. Attendees are encouraged to get tickets early and dress in derby attire/hats for this Kentucky Derby-themed party held at the Frauenthal Ballroom in downtown Muskegon. The event is from 5:00 pm – 8:00 pm and will feature the Kentucky Derby Race live on extra-large screens. Additional activities include a silent and live auction, betting games, cash bar, and hors-d’oeuvres throughout the evening. This year’s proceeds will be used to help fund Day Camp at Pioneer Trails. Day Camp is a program dedicated to serving children and young adults, ages 6 to 26, with physical disabilities, cognitive impairments, and autism. Campers enjoy games, arts and crafts, nature education, swimming, canoeing, and fishing. Day Camp includes care provided by uniquely trained staff and transportation from Muskegon. Due to funding changes, nearly a third of the funding necessary to run Day Camp needs to come from external sources. Pioneer Resources began as an unincorporated association of parents and educators in the late 1940s, operating as Pioneer School and providing special education and therapy. 63 years later the agency offers a diverse array of individualized supports and services for persons with disabilities as well as seniors. MUSKEGON, MI – The historic road to Muskegon’s famed Pere Marquette Park and Lake Michigan beaches will undergo reconstruction with a $6.1 million road and utility project this 2019 construction season. Lakeshore Drive from Laketon Avenue to McCracken Street will be under reconstruction beginning April 15, 2019 withone-way westbound traffic only through late July 2019. After two-way traffic returns to Lakeshore Drive in late July 2019, the entire roadway reconstruction, water and sewer upgrades and new streetscape through the Lakeside Business District will be completed by October 2019. Those going to the Lakeside Business District, the west end of the city of Muskegon or Pere Marquette Park on Lakeshore Drive know the roadway is in need of major work. The city of Muskegon has contracted with Jackson-Merkey Contractors Inc. of Muskegon to complete the Lakeshore Drive work. The city and the contractor will be allowing at least one-way westbound traffic on Lakeshore Drive through the entire project. When needed, eastbound traffic will be rerouted south on Lincoln Street and then to Sherman Boulevard to the east. During the construction, cross streets from the Lakeside Neighborhood should remain open on most all days including the heavily traveled McCracken and Addison streets to the south. “The businesses and offices of the Lakeside District will be open through the construction project and some will provide discounts and specials to their customers,” said Bill Schneider of the Lakeside Business District and Schneider Risk Management LLC. Access to the Lake Express High-Speed Ferry, Great Lakes Marina, the SS Milwaukee Clipper and the Grand Trunk boat launch will continue through the construction. In particular, during construction, Lakeside business and office customers can use the parking lots to the south of Lakeshore Drive behind the business between Mann and Moon streets. The parking lot on the north side of Lakeshore Drive just west of the Great Lakes Marina entrance also will be available for free public parking. MUSKEGON, MI: Muskegon County schools will improve the safety and security of students, staff and school buildings through the purchase of technology and equipment as recipients of $1,655,942 in competitive state grant funds offered up by the Michigan State Police (MSP). In Muskegon County nine local schools and the Muskegon Area Intermediate School District (MAISD) were among the 221 schools selected to earn a portion of the $25 million in Michigan’s 2019 Competitive School Safety Grant Program. Muskegon Catholic Central will receive $48,770; North Muskegon Public Schools $48,770; MAISD $146,311; Ravenna Public Schools $146,311; Reeths-Puffer Schools $243,852; Three Oaks Public School Academy $10,749; Orchard View Schools $158,585, and Whitehall District Schools $85,836. In addition, grants that require a 25% cash match by the receiving school were awarded to Fruitport Community Schools for $440,707 and Montague Area Public Schools for $326,051. All schools must follow strict requirements to receive the reimbursement-only grants and must complete their spending by June 1, 2020. Grant applications were reviewed by a committee that included representatives from the Michigan State Police, Michigan Association of Chiefs of Police, Michigan Sheriffs’ Association, Michigan Department of Education, Michigan Association of Non-Public Schools and other school safety professionals. In total, Michigan schools applied for over $46 million in funding for security enhancements. Per the appropriation, priority was given to applicants who had not received school safety grant funds in the initial round of grant funding in 2015. In 2015, Muskegon Public Schools received an $80,000 grant and in 2018 Calvary Christian Schools, Ravenna Public Schools, Holton Public Schools, Mona Shores Public Schools, Muskegon Montessori Academy for Environmental Change, and Oakridge Public Schools received a total of $784,444 in safety grant dollars. “We are fortunate in Muskegon County to have a unified Emergency Operations Plans developed collaboratively with first responders from multiple jurisdictions across Muskegon County,” said Severson. “These grant funds make our work together even better,” he added. Fruitport Community Schools will purchase and install a wireless locking system so that every door in each building can be locked remotely with the push of a button in the event of a crisis. They will also install enhanced safety and security window film on high exposure windows in each building, and install signage to help first responders navigate through buildings in the event of a crisis or emergency. Montague Area Public Schools will enhance secure access systems, public address systems, and upgrade exterior and interior doors. Work at Muskegon Area ISD’s Wesley School, Career Tech Center, and the new Craig Transition Campus will include a panic alert system, more secure vestibules, enhanced safety and security window film, and replacement of interior and exterior doors, frames, and locks. Muskegon Catholic Central will upgrade its Access Control Software. Current door controllers and strikes will be replaced to work with the new software. Additional controllers, both inside and outside of the building, will be added to the system. Signage numbering all exterior doors will be installed. Also, barricade safety devices will be purchased for interior door safety. North Muskegon Public Schools will be improving safety measures at all exterior entrances through implementation of enhanced safety and security window dressing and door safety barriers, updating the public address system throughout the district, and streamlining facility camera system accessibility with local law enforcement. Orchard View Schools will address interior and exterior windows with enhanced safety and security window film, update the internal communications system at the middle school and upgrade interior doors as needed throughout the district. Ravenna Public Schools will install panic buttons in all district offices along with new electronic notification displays in all large-group spaces. They will also add enhanced safety and security window film to entry doors and add secure buzz-in systems at their elementary and middle school buildings. Door hardware and locks will be upgraded to be more secure per police recommendations. District signage will be added to all exterior doors as well. Reeths-Puffer Schools will augment interior window security with enhanced safety and security window film, and improve internal and external emergency communications with inter-connected technology applications. Three Oaks Public School Academy will enhance secure access systems to interior and exterior doors with keyless entry swipe systems throughout the building, install motion lights at entrance doors, and improve mobile communication with portable classrooms. Whitehall District Schools will enhance secure access systems to interior and exterior doors, improve and upgrade security cameras in each building, and improve remote entry systems. Hello everyone, we are having a movie fundraiser at Cinema Carousel on April 19th at 4 pm and April 20th at 1 pm. The movie will be BREAKTHROUGH which is based on a true story. Our Fundraiser is to help further along our vision and mission to help young women in our city and the surrounding area know who they are in Christ and that they are Chosen. We will be offering programs for the young women we come in contact with free of charge, as well as mentorship and more. Although we are not a church, we are a non-profit that believes our mission is to help our community by helping all you women with guidance, love, compassion, and more. We are here to help all young woman from all walks of life. Please support our fundraiser as you support us you will be inspired at the same time…you may purchase tickets at Eventbrite the link is below. You are invited to attend a Ribbon Cutting Ceremony that will take place on May 11, 2019, 10am at 2190 North Maple Island Rd. in Twin Lake. This will kick off the opening of phase one including a 3 mile beginner loop, or the “green loop”, as trail users will call it. This specific trail will have a tread width between 3 to 4 feet, and an average grade between one and three percent. Mosquito Creek Trails, named for the Mosquito Creek stream that runs through the 500‐acre Muskegon County recreation area, will debut its initial trail this spring. The series of multi‐use trails will have varying difficulties, widths and grades. Mosquito Creek Trails will be built so that user experiences support the local landscape and environment instead of working against it. The trails will utilize natural obstacles and anchor elements to define the trails. This will deter users from unintentionally widening paths. The trails will be created to optimize water drainage, counter the force of users and prevent erosion. In the fall of 2016, Michigan’s Edge Mountain Biking Association (MEMBA) members met with Visit Muskegon and Muskegon County Wastewater Complex staff. Together they identified approximately 500 acres of untouched land as an ideal area to create a recreation area. Upon reaching a collaborative agreement with Muskegon County, MEMBA raised over $50,000 to engage with Applied Trails Research and Dirt Artisans. These two companies provided a comprehensive engineering and design proposal. Applied Trails Research is a trails and recreation consulting firm that specializes in spatial data analysis, mapping resources, and impact minimization planning for outdoor and reaction management. Dirt Artisans designed Mosquito Creek based on the resources and data from Applied Trails Research. Mosquito Creek Trails will offer the opportunity for local cyclists and visitors to use the multi‐use trails year round. As these trails will be shared‐use, MEMBA looks to build a better local trail community that will foster a pride in our recreation options and keep users honest and respectful towards each other. These trails will support Muskegon County’s need for increased access to safe and secure trails in which users have a variety of options for exercise and recreational socialization. For mountain bikers specifically, the trails will also provide a variety of challenging and thrilling obstacles. MEMBA is currently fundraising to complete phase two and three of the project. Phase two will include three to four miles of trail and is projected to be completed in the fall of 2019. Phase three will add an additional three to four miles of trail, two bridges, and a restroom facility. Phase three will complete the project, and is expected for 2020. Michigan’s Adventure opens on Memorial Day Weekend and expects to hire over 1,200 seasonal associates during the 2019 season. A job fair will be held on Saturday, April 13 from 10:00 am – 2:00 p.m. at the Michigan’s Adventure Training Center, 4750 Whitehall Road in Muskegon. 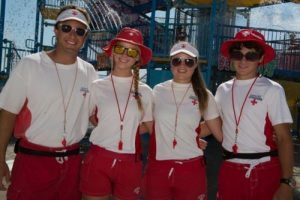 Applications are being accepted for all positions, including food and beverage, ride operations, lifeguards, merchandise, games, admissions, safety and security, park services, office staff and maintenance. The park provides paid training for all positions. Applicants who are at least 18 years of age are offered a minimum starting wage of $11 per hour, and those aged 16 and 17 will start at a wage of at least $10 per hour. Benefits include the potential for an attendance-based bonus, free admission to all Cedar Fair parks, free tickets to use for friends and family members and discounted food and drinks. Michigan’s Adventure offers flexible scheduling to fit all applicant availability, including short and long shifts. All interested parties are encouraged to apply at www.miadventure.com/jobs and then visit the job fair for an on-site interview. Anyone not able to attend the Job Fair is encouraged to apply at www.miadventure.com/jobs as Michigan’s Adventure hires throughout the spring and summer. Michigan’s Adventure is the state’s largest amusement park and water park offering 60 rides and attractions including seven roller coasters. The park is owned and operated by Cedar Fair Entertainment Company (NYSE: FUN), a publicly traded partnership and one of the largest regional amusement-resort operators in the world. The Company owns and operates 11 amusement parks, two outdoor water parks, one indoor water park and four hotels. For more information, see www.cedarfair.com. Jon Allan will be the guest speaker at this year’s induction ceremony for the Michigan Environmental Hall of Fame to be held on May 15, 7 PM at the Gerald R. Ford Presidential Museum in Grand Rapids. Mr. Allan recently retired as Director of the Office of the Great Lakes. He has also served in Executive Management for Consumers Energy in environmental and energy management, government, and regulatory affairs. He has taught courses in biology, ecology and environmental impact assessment. He holds an undergraduate degree in Fisheries and Wildlife and a Masters in Zoology from MSU.